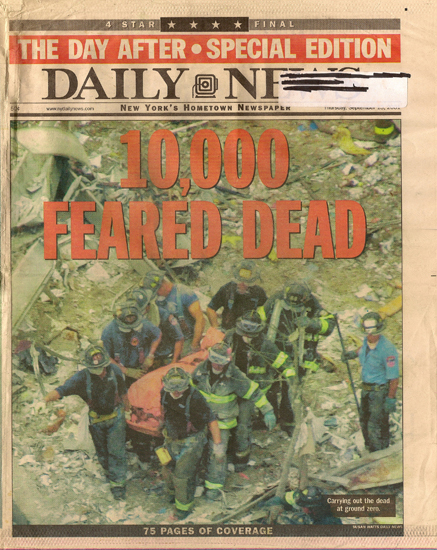 Cover of the New York Daily News, September 13, 2001. I remember feeling a similar sentiment in New York in the days after 9/11. Personal grief merging with vicarious grief, merging with cultural grief. It was hard to separate the layers. Those days were marked by confusion and fear. Not understanding who had attacked the United States and why, not knowing how many were missing (or dead), and a fear that there were other attacks in the works. Numerous images and objects with heavy symbolic resonance emerged in the days after 9/11: postcards of the towers intact, images of the Statue of Liberty and the faces of the missing. There is, however, one image that punctuated the landscape in astounding quantities: the flag. Repeated on bodies, outside personal homes and on storefronts, the American flag collapsed the traumatic response into a concise pattern of stars and stripes. Neighborhoods on the Lower East Side and Brooklyn saw flag displays on cars, in windows and between buildings change from Dominican and Puerto Rican flags to American flags overnight. The flag was carried on the body in the form of a pin, bandanna or t-shirt. It was posted to store windows and wrapped around car hoods to express sympathy for those who lost loved ones, membership in a community directly impacted by 9/11 and national solidarity. It was also a way to protect one’s self during a time of great fear and suspicion. It is this working through the open wound of trauma that interests me, with all of its beautiful coming together and all of its hideous scars. 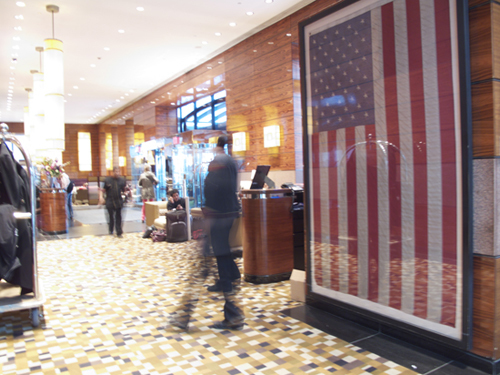 Commemorating 9/11, working through that trauma, can be found subtly embedded throughout the cultural landscape today, in both public and personal spaces. And just yesterday, I was speaking with a colleague at work in front of the microwave, during the five-minute pause between setting the timer and the final, high-pitched ding letting us know the food was warm. Michael asked me if I was a practicing artist, aside from my work in public art administration. And this was the start of a kitchen conversation about 9/11. It turns out Michael was living in Los Angeles in 2001, but working as a consultant for a company located in the World Trade Center complex. He was scheduled to be in one of the towers just a week after they fell. He lost 5 friends in those buildings. 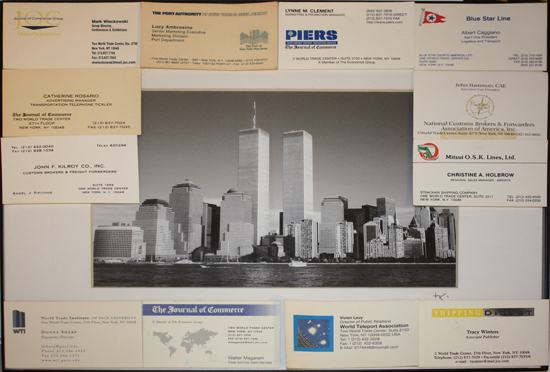 When he returned to New York that October, he purchased a framed photo of the towers as they once stood. The photo is in his office today, all these years later, surrounded by the business cards of the people he worked with in those now absent twins. Like I said, huge tragedy strikes again & is commemorated in similar ways. Its been all too frequent. Its kind of an epidemic, like the assassinations of John Kennedy, MLK and Bobby Kennedy in such quick succession, The way of the world we live in……. 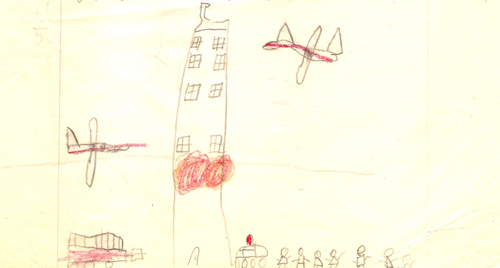 You are currently reading The Open Wound of Trauma at After 9/11.